Alex Hart scored on a tip-in with 2.5 seconds remaining to give UC Santa Barbara a stunning 56-54 victory over the University of Hawai’i basketball team in a Big West Conference game on Thursday at Santa Barbara, Calif. The Warriors rallied from a nine-point deficit with less than nine minutes remaining to tie the score at 54, but Hart’s tip-in gave the Gauchos the upset. Hawai’i dropped to 12-13 overall and 6-6 in the Big West. UCSB improved to 4-20 overall and 2-10 in the conference. The Gauchos entered the game with an eight-game losing streak. Gibson Johnson led the Warriors with a double-double of 16 points and 10 rebounds, but he was the only Hawai’i player to score in double-figures. Sheriff Drammeh scored nine, and Leland Green scored seven in his return to action. He missed the previous three games due to illness. Leading scorer Noah Allen, who scored 34 in a 22-point victory over UCSB in Honolulu on January 28, contributed six points and six rebounds. The Warriors shot just 36 percent (18 for 50) from the field, including 24 percent (6 for 25) from 3-point range. UCSB, which has lost three starters for the season since late-December, shot 44.7 percent from the field and out-rebounded Hawai’i 33-32. Hart led the Gauchos with 16 points. Hawai’i had a 13-8 lead midway through the first half, but the Gauchos responded with an 11-0 run to take a 19-13 lead. UCSB led by as many as eight points in the first half, and eventually took a 32-26 advantage at intermission. The Warriors shot just 36 percent (9 for 25) from the field in the first half, and committed nine turnovers. By comparison, the Gauchos shot 45.8 percent (11 for 24) in the first half, and out-rebounded Hawai’i 18-15. Hawai’i tied it at 37 with 13:08 remaining in the second half after Green collected a steal and scored on a layup. But UCSB reeled off the next six points to regain control at 43-37 with 10:50 remaining. 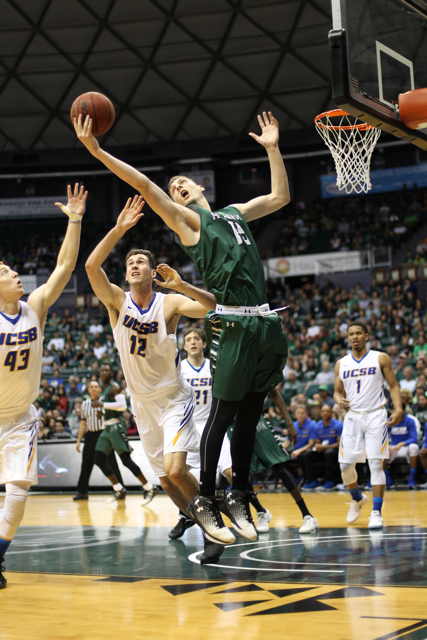 The Gauchos increased their lead 48-39 with 8:39 left, but Hawai’i kept it close. Two free throws by Allen with 2:33 remaining got Hawai’i within one, 52-51. The Warriors had possession of the ball trailing by one, but committed a turnover. UCSB’s Hart scored on a layup on the ensuing possession to give the Gauchos a 54-51 lead. Green then hit an open 3-pointer from the wing with 1:24 remaining to tie the score at 54. Ahh, airline food. The next game will be better. Go Bows ! UH was fully loaded. Everyone well. USCB give them credit. They just executed and got win for coach Williams. Hope Ganot gets 2 scholarships and gets to receiving to rebuild for coming years. Hawaii has 4 more games. Still can win however agreed Noah cannot disappear. If Warriors make post season…They have to have guys off bench step up like last year. 15 or 16 wins hopefully winning season. Very embarrassing loss for Warriors. They came out flat when we need to just bury UCSB but that didn’t happen. This years team marked with major inconsistencies. I still can’t believe we lost to the crappiest team in the conference. Unbelievable loss. We need a win badly on Saturday It don’t get easier. Come on Warriors get your act together !